Tangyuan (dumplings 湯圓) traditionally served on the day of Chinese Winter Solstice Festival (冬至), that fell on 22nd December this year. They are mainly made from glutinous rice flour, with different kinds of fillings or without any at all, boiled in syrup. Chinese families in southern areas will eat tangyuan on Chinese New Year’s Eve too. My mum used to cook us some at midnight on that day, with a symbolic meaning of bringing harmony in the family. Needless to say, the tradition of having tangyuan on the 15th day of the first month in the Lunar calendar, also called Lantern Festival (元宵) is widely spread in different provinces of China. You’ll see how popular tangyuan is. They are often served in celebrating occasions. I happened to see some fresh pandan leaves in a nearby Asian grocer. So, I can’t wait to grab some back home to make some pandan tangyuan for celebrating Winter Solstice. I love its greenie look and pleasant aroma, very different from the traditional ones in white. The palm sugar melted inside, running out after the first bite, will make you utter “ooz”, just like these sweet potato glutinous rice balls I’ve shared before. 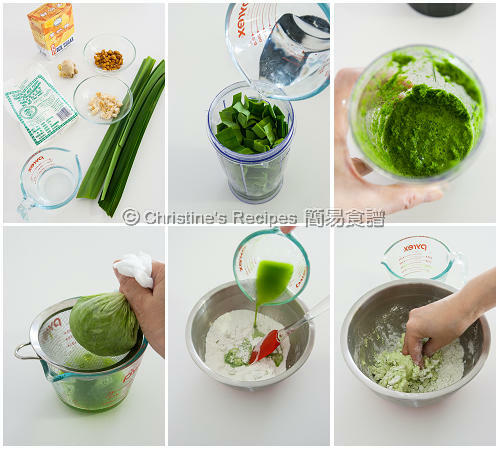 I used a food processor to process pandan leaves into a paste. Then squeeze out its fragrant liquid. Mix glutinous rice flour with pandan juice and water. It takes only a few minutes to knead into a dough. Wrap the fillings inside and roll into a ball shape. You're good to go. Boil them for 10 minutes or so. A fragrant, delicious dessert can be served. Cut the pandan leaves with scissors. Process them in a food processor into a paste. Squeeze out the juice with a muslin cloth. Divide into 12 equal portions. Roll each portion into a ball. Flatten into a disc shape. Place a heaped teaspoon of peanuts and palm sugar in the middle. Fold edges and seal the fillings inside. Gently roll it between two palms into a ball shape. Repeat this step with the remaining dough and fillings. Prepare the syrup：Place water, rock sugar and ginger into a small saucepan. Bring it to a boil and cook for 10 minutes over medium heat. Add more sugar to taste if needed. In the meantime, prepare another large pot of boiling water. Carefully drop the dumplings into the boiling water. Immediately use chopsticks to stir the water in order to prevent the dumplings stick to the bottom. As soon as the dumplings float to the surface, drain and transfer them into the syrup. Simmer for about 5 minutes over low heat. Serve with syrup in a bowl immediately. Or you might like to serve on a plate and sprinkle some crushed peanuts with palm sugar. By using another pot of boiling water to cook the dumplings first will help the syrup keep clear. For convenience, you might cook them in the syrup if you don’t mind the syrup turning cloudy. If the dumplings are boiling in the syrup too long, their colours will turn pale green. The upside is that the pandan flavours will steep in the syrup. The palm sugar wrapped inside will be melted and runny after heated. Use a piece of muslim cloth to help squeeze out the juice. Or you can use coffee filter paper instead. If nothing is available, your clean hands are good tools. 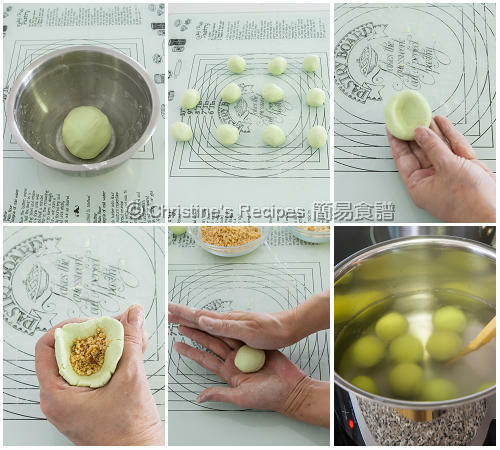 That's a very creative version of serving tangyuan. I just discovered that making the dough before hand, keep chilled overnight, the tangyuan is more chewy. 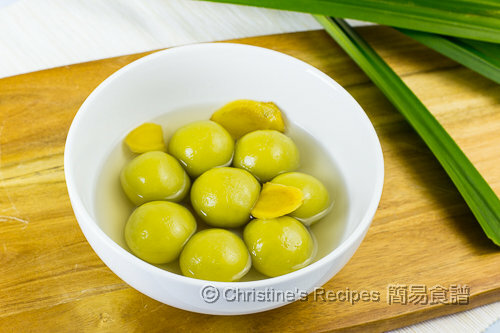 I love the idea of using pandan to colour the dumplings. They look very inviting! this looks too delicious!!! thanks for sharing!! Hi Christine , just passing by to greet a Merry Christmas ! The peanuts inside won't become a paste as long as they aren't grounded finely. I like a bit of texture, so just chopped them roughly. 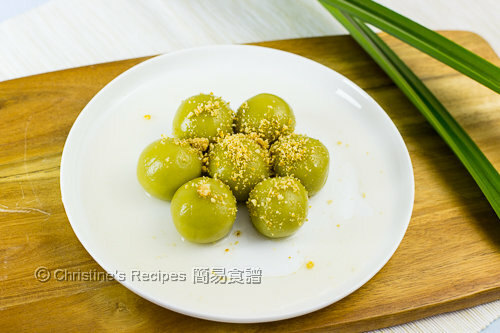 Sure, sesame powder is great for making tang yuan filling . Is it by any chance possible to make this with store bought pandan paste. Where I live they don't sell pandan leaves, so I always have a small bottle of instant paste at hand. Problem is there aren't many recipes that give instructions for store bought pasta, at best they give it for pandan essence. 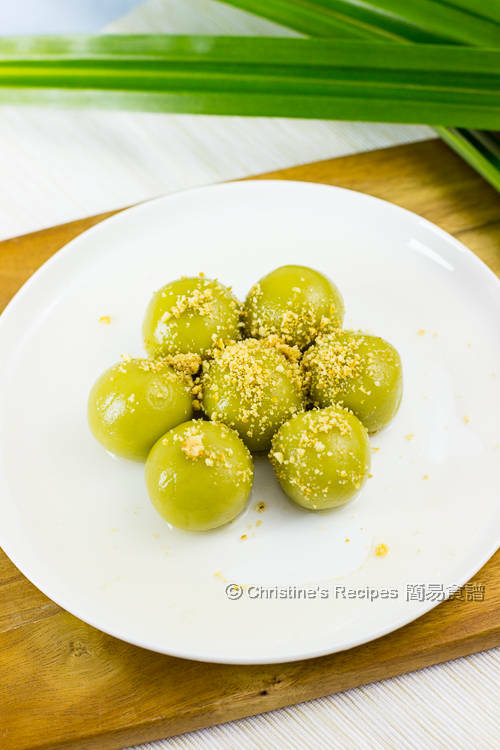 I hope you can help me out because I would love to make your pandan dumplings! If you want to use pandan paste, it's fine. Just add a few drops until you get the colour you want. You need to add a bit of water to replace the pandan juice and adjust the dough texture though.